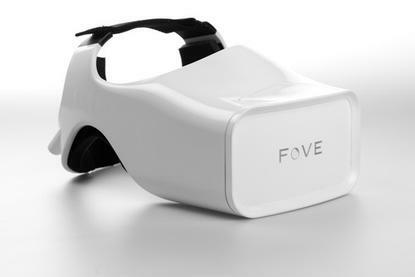 Fove's headset will let a person use eye movements to control virtual reality environments. The company has developed a headset that uses eye-tracking technology to create a hands-free virtual reality where all of a person's actions are controlled by eye movements. This technology sets Fove's headset apart from other virtual reality devices that only use head tracking to control an environment, said Fove co-founder and CEO Yuka Kojima. Fove's headset can calculate field of depth, allowing gamers to aim more accurately at a target, said Yuka, who previously developed video games at Sony. Tracking eye movements allows the headset to concentrate its processing power on the image the person is looking at, said Yuka. This process, called foveated rendering, adjusts focus and cuts back on the computing power need to generate a scene, she added. Incorporating eye tracking into virtual reality games allows for better player interaction, said Foveco-founder and CTO Lochlainn Wilson. A game's characters can react to a player's gaze by looking away or returning it. Developers can program games to carry out specific functions, like making a monster appear when a player looks at a certain spot, he said. A person's eyes are fast, accurate and very responsive, giving them an edge over traditional game controllers, said Wilson. Instead of having to use a controller to target and fire a weapon at a game character, for example, a person can aim and shoot by staring, he said. The headset handles all image processing and uses two infrared cameras to track a user's pupils, said Wilson, who has a background in facial recognition technology. Beyond being used for video games, Fove's headset could be used in enterprise settings, Wilson said. For example, stock traders could use the device to quickly buy and sell shares just by looking at a stock's symbol. Wilson imagines uses for other industries including education and health care. After creating a few prototypes, Fove launched a crowd funding campaign on Tuesday to raise US$250,000 and start manufacturing the headset. Pledging $349 will get a person a discount on the headset, which would normally cost $500. Headsets begin shipping to early backers in May 2016. Any standard gaming computer will work with Fove, the company said. Computers need a mini display port output and a graphics card, but, unlike the Oculus Rift headset, there aren't any minimum specifications. However, the experience will be better on a powerful computer, Fove said.